boarding passes were un-named, and no seats were allocated. free seating option! this was a first for me at least! AirKBZ 248 we were on does a circuit route Yangon-Bagan-Heho-Yangon… you are visiting and you want to fly to these destinations might be a good route to take as it helps avoid multiple hops most flights here have. but i’m sure there’s other alternatives.. air KBZ was what we chose. sorting sticker!! this is getting to be fun! need to purchase this ticket! 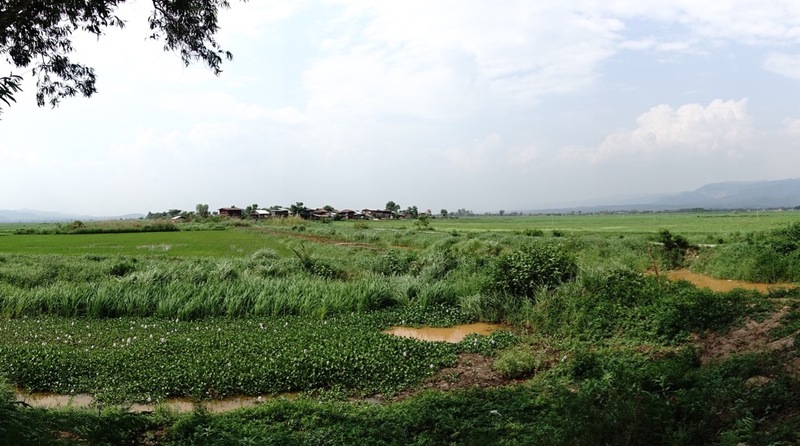 we are staying in Nyaung Shwe, a tiny township north of inle lake, it feels primary like a guest house town with tons of guesthouses/hotels and a bunch of restaurants around… but feels a bit more remote than bagan even..
rented proper bikes this time! this whole country’s got these! this time we chose to rent proper bikes and explore… tip.. get a mountain bike with the gear switching ability, its amazing how useful it is under the changing conditions of the road, you will be glad you did. the town is small, surrounded by canals of water and paddyfields… which contribute to a great panoramic view. the bike ride was breathtaking as we crossed paddyfields, into tiny villages, and through the bamboo plantations… totally worth the physical effort. the rain was unexpected for us at least, bagan was having such a dry and hot weather…. we were unprepared. but the kindness of the locals was amazing, twice we were stranded in the rain and both times we were invited into the homes of the locals to get out of the rain and they tried to make conversation as much as they could, offered us tea.. to complete strangers from a foriegn land… and to be honest i’ve been seeing this trend everywhere here.. its people are just so friendly and genuinely curious. food today was interesting. lunch was at a small italian sorta place called the star flower, surprisingly they did have their own wood fired oven for pizzas and fresh basil growing outside. they even showed us their oven with a lot of pride. the pizza’s were good! specially the one with the fresh pesto… and their milkshakes and lassi was pretty darn good too.. creamy and full of flavour. for dinner we went to another lonely planet recommended local food place called the Lin Htet… had a mix of local curries and rice with the accompaniments that come along with a traditional meal such as soups, anchovies, pickles etc… kinda reminds me of a thali meal from india.. as far as the concept goes. food is good here and the price is reasonable too.. under USD 3 for a full meal without drinks. looks like the LP recommendation is working, whole bunch of backpackers/foreigners show up here. Tomorrow is the day for the lake 🙂 .. This entry was posted in Food, Travel and tagged adventure, biking, burma, inle, lake, lake inle, Myanmar, Nyaung Shwe, pagodas, review, travel on May 13, 2015 by ahmedriyazi.